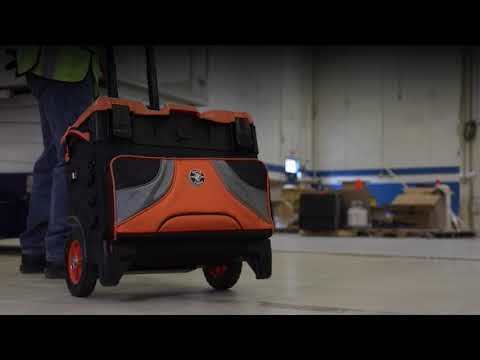 The rugged Tradesman Pro™ Tool Master Rolling Tool Bag from Klein Tools will easily roll over tough terrain with 8-Inch (203.2 mm) wheels, high clearance, and a heavy-duty telescoping handle. Transport up to 250-Pounds (113 kg) of your tools in the wide open interior. Organize smaller items in 19 pockets inside and out, all constructed with durable1680d ballistic weave material. The hard top allows for stacking and has compartments to hold your cell phone, beverages, or small parts. Twist-lock Klein LED Light or Wireless Speaker on front mount (items sold separately).